One of the most common questions I am asked about homeschooling is "What math do you use?" Since the time we started using My Father's World a few years ago, we have stuck with their recommendation of Singapore Math. Aside from one little foray into Math Mammoth (which I also loved and highly recommend), we have not found it necessary to supplement at all. This year Miss M has been working through Singapore 3A and 3B. She was so pleased with herself when she completed level 3A. Of course, I was proud too! Level 3A focused on working with larger numbers (up to 10,000) and really nailing in those multiplication and division tables. One day I sat down with a pile of flashcards to drill Miss M and since my camera was handy, I snapped a few shots of her in constant motion. Apparently acrobatics help with math fact memorization! Level 3B moved on to some topics that really lent themselves to hands-on learning: length, weight, and capacity. Miss M measured liters of water to see how many would fill a bucket, a tub. She weighed out a kilogram, a pound, a gram, and an ounce of rice to see just how much each of those units is. 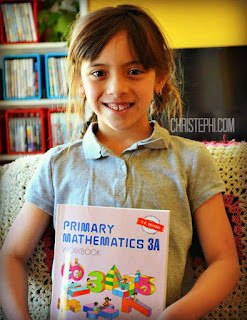 These are some of her favorite lessons, and with good reason! The weight activity I saw on Pinterest, but the capacity activity was written right in her textbook. 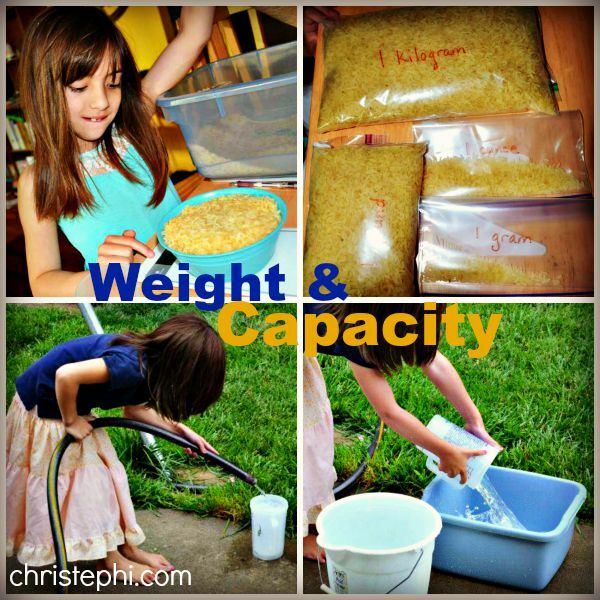 And of course no study of capacity would be complete without this great video!